...it looks quite a lot like a Land Rover Discovery 4, doesn't it? ...and even clones the Volkswagen badge to add to the illusion. ...although we think that the Mini did it better. It somewhat lacks the presence of the X5 though. In profile, does the CH Auto Lithia look familiar? 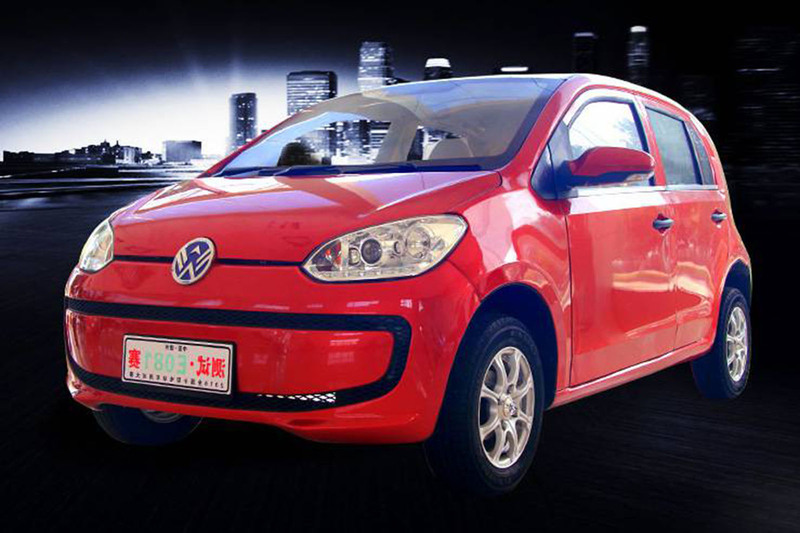 Chinese copycat cars are fast becoming a staple of the local market. With the Kotye SR9 and Weikerui V7 having recently landed as blatant Porsche Macan and Volkswagen e-Up clones, it shows no sign of slowing down, either. With the Guangzhou motor show now open, we may get a few new entrants into our copycat car hall of fame, so join us as we trundle through some other obvious Chinese copycats from recent years below. The Lifan 320 is a 1.3-litre supermini produced by Lifan. First revealed at the 2008 Beijing motor show, it gained notoriety for its similarity to the Mini hatch. A facelift in 2013 distanced it from the Mini comparisons, but the car now bears more resemblance to the Fiat 500 - curious. The X7 made waves in 2014 for its remarkable impression of the Range Rover Evoque. In fact, Land Rover was so impressed that it took Landwind to task over the X7 – although Chinese authorities took the side of Landwind and the £14,000 X7 was put on sale. It may have the front end of the first-gen Lexus RX, but in profile and rear views the BMW X5 influence is impossible to miss. BMW certainly didn’t miss it, taking Shuanghuan to court over the SCEO. As a result, the car was banned in Germany. You’d think the Audi R8’s distinctive profile could only feature on the R8, but CH Auto liked the design so much that it decided it would work well on the Lithia – its electric supercar. The front and rear aren’t so familiar, and are both distinctive and attractive, but the profile is unmistakably R8. Not even discontinued models are safe from China's copycat designers. The design of the Land Rover Discovery 4, which was replaced this year, has been used to inspire the Changan X70A, a large SUV from the Chongqing-based car maker. While the front looks different, the car's side profile is unmistakably Disco-derived. Proving that China’s automotive copycat culture isn’t a new thing, the Geely BL managed to take inspiration from the Hyundai Coupe at the front and the Toyota Supra at the rear. Thankfully, Geely hasn’t taken the same approach to design with Volvo. Resembling the Tesla Model S both inside and out, the Youxia – Chinese for Knight Rider (yes, that one) - features Kitt-inspired LCD lights inspired by its namesake. A 0-62mph time of 5.6sec and range of 286 miles are claimed. When contacted, Tesla would not comment on the car. Don’t let the name fool you; this car is neither a copy of the Noble M600, nor are its design intentions noble. Despite its appearance and similarity to the two-seat Smart Fortwo, the Noble has seating for four – although how comfortably those four can be seated is unknown. If you were to choose an Aston Martin car to copy, the chances are you wouldn’t choose the Cygnet. Called the Pioneer, Dojo’s copycat car is an all-electric Cygnet clone, which itself was based on the Toyota iQ (although not copied, we hasten to add). Range is quoted at 75 miles, while top speed is a blistering 37mph. As copycats go, this one's an innovator. The front end and rear lights are miniaturised versions of the Range Rover Evoque, but everything else is a tall, awkward supermini. We don't think JLR will be losing any sleep over this one stealing the Evoque's sales. Kia, on the other hand, may be a little cross about this. The Yogomo 330 is one of the closest copycats we've seen, although where a knock-off version of an £7495 supermini will find sales will be the real test. From the rear, the Geely Merrie is another anonymous Chinese saloon. From the front, it's a Mercedes-Benz C-Class. There's no slight tweaks or alterations here, just a C-Class's front end, complete with Merc-inspired (read copied) hood ornament emblem. The body of a Stuttgart bestseller has been copied to produce this, the new Zotye SR9. On sale in China this Wednesday at a price around £12,300, the SR9 will initially come with just one engine – a turbocharged 2.0-litre four-cylinder petrol unit sourced from Mitsubishi developing 187bhp and 184lb ft of torque. The latest addition to clone club is the Weikerui V7, or in layman's terms, the Volkswagen e-Up clone. Even the badge on the front apes the Volkswagen logo, much like the copied BMW logo below. The BMW roundel was also plundered, albeit in a tweaked form. Although it's more of an honourable mention than a copycat car, it's clear to see where BYD got inspiration for the font, colour scheme, shape and layout of its logo. A Chinese clothing brand also faced legal action from BMW over its 'BMN' roundel. That's all, though.